C2 Systems’ Wireless Consulting and RF Services Division provides network design and implementation support services to wireless service providers, public utility companies, infrastructure developers, and related industries. We facilitate the efforts of wireless providers by leveraging our extensive experience, expertise, internally-developed analysis tools, and custom tailored reports, to provide our clients a quality deliverable in a timely and efficient manner. 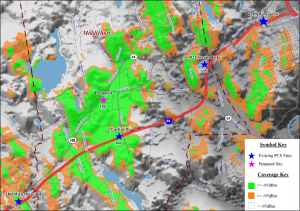 With a full complement of state-of-the-art test and measurement equipment, propagation modeling tools, and our related internally developed software, we are able to measure, record, and analyze the performance of 3G and 4G networks operating in 700, 800, 1900 MHz, AWS and WCS frequencies, WLAN, and cutting-edge technologies.